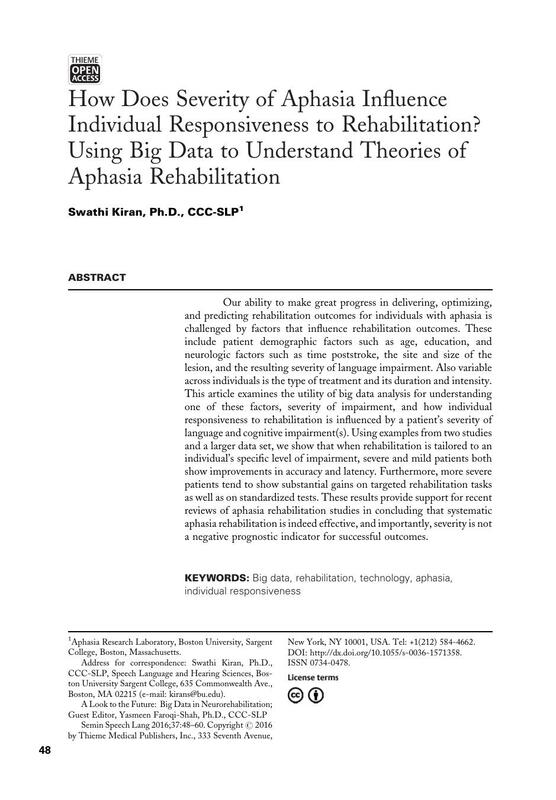 Our ability to make great progress in delivering, optimizing, and predicting rehabilitation outcomes for individuals with aphasia is challenged by factors that influence rehabilitation outcomes. These include patient demographic factors such as age, education, and neurologic factors such as time poststroke, the site and size of the lesion, and the resulting severity of language impairment. Also variable across individuals is the type of treatment and its duration and intensity. This article examines the utility of big data analysis for understanding one of these factors, severity of impairment, and how individual responsiveness to rehabilitation is influenced by a patient's severity of language and cognitive impairment(s). Using examples from two studies and a larger data set, we show that when rehabilitation is tailored to an individual's specific level of impairment, severe and mild patients both show improvements in accuracy and latency. Furthermore, more severe patients tend to show substantial gains on targeted rehabilitation tasks as well as on standardized tests. These results provide support for recent reviews of aphasia rehabilitation studies in concluding that systematic aphasia rehabilitation is indeed effective, and importantly, severity is not a negative prognostic indicator for successful outcomes.